‘Lord our God, we praise you and thank you that you, in your dear Son, in mercy beyond understanding, would humble yourself so much for our sakes, in order that in him we may be so highly exalted for your sake. We praise you and thank you for his mighty decision regarding your people Israel and the pagan nations from which you called our ancestors. We praise you and thank you for all of your gracious election and calling, that you are also the God of the rejected and the uncalled, and that you never cease to deal with each one of us in a fatherly and righteous manner. Let us never tire of recognizing you and praying to you in all of these mysteries, that we may in faith lay hold of your Word, through which you magnify your honor and give us, with eternal blessing, peace and joy, even in this life. We pray for your church here and in all nations, for the sleeping church, that it may awaken; for the persecuted church, that it may continually rejoice and be assured of what it has in you; and for the confessing church, that it may live not for its own sake, but for your glory. We pray for the rulers and the authorities all over the world: for the good ones, that you may preserve them; and for the bad ones, that you may either turn their hearts or put an end to their power, all according to your will; and for everyone, that you may advise them that they are and must remain your servants. We pray that all tyranny and disorder may be fended off, and that all oppressed nations and people may be granted justice. We pray for the poor, the sick, the prisoners, the helpless, and the troubled, for all who suffer – perhaps from something only you know – that you yourself may comfort them with the hope of your kingdom. Amen’. 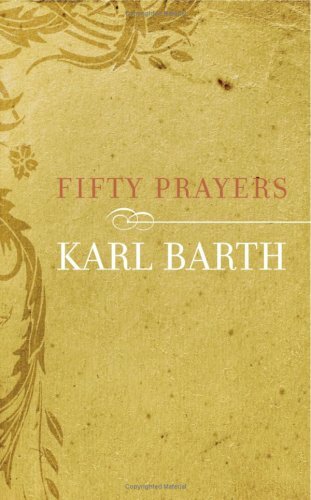 – Karl Barth, Fifty Prayers (trans. David Carl Stassen; London/Louisville: Westminster John Knox, 2008), 20–1. BTW: The latest edition of IJST includes an article by A.J. Cocksworth titled ‘Attending to the Sabbath: An Alternative Direction in Karl Barth’s Theology of Prayer’ (13/3, July 2011, 251–271).